"Time to split truth from myth about nursing"
May 5, 2006 -- Today the Ithaca Journal published a strong, well written Nurses Week op-ed by Nancy Banfield Johnson, RN, MSN, ANP. Johnson is a nurse manager at Kendal at Ithaca (a Quaker continuing care retirement community in New York). Her piece argues that nursing remains poorly understood, particularly given the inadequate vision the public gets from the media, and it asks nurses to dispel key myths about their profession. In particular, Johnson points to the common misbeliefs that all members of the nursing team are the same, that nurses are managed by and dependent on physicians, and that nursing is simply a part of the medical profession. In reasonable terms, the piece explains why those are just myths. And it highlights the real importance, diversity, and unique nature of the profession. It's an excellent way to celebrate Nurses Week. And we're not just saying that because Johnson cites the Center web site as a good place to learn more about the challenges nursing faces. Johnson notes that poll results show that the public regards nurses as honest and ethical. But she argues that the profession remains "poorly understood," suggesting that this is at least in part because "television dramas like ER, Grey's Anatomy and House frequently portray nursing in a negative light or fail to show the valuable contributions of nurses." To counter the lack of media support, the piece argues that the nursing team itself must counter the stereotypes and myths that continue to prevail. The remainder of the piece counters four of these "Myths" with paragraphs headed "Truth." In response to the myth that "the word nurse can be used interchangeably for all members of the nursing team," Johnson carefully explains the differences between the training of RNs, LPNs, and NAs. She notes that RNs with a bachelor's degree can go on to earn graduate degrees in nursing, and that RNs work in a wide variety of settings and substantive practice areas, from managers to researchers, and from pediatrics to public health. As for the notion that "[p]hysicians supervise nurses," Johnson calmly makes clear that nurses manage nurses, from the director of nursing through unit-specific nurse managers to the nurses who "direct" LPNs and NAs. Addressing the belief that RNs are "totally dependent on physicians," the piece explains that in fact nurses independently "diagnose and treat human responses to actual or potential health problems," using "a problem-solving method called the nursing process." Johnson says that nurses assess patient needs in a range of areas from oxygenation to psychosocial function, and that RNs then create nursing care plans that the entire nursing team implements and evaluates. Finally, addressing the myth that nursing is "part of the medical profession," the piece explains that "[m]edicine and nursing are separate professions who work collaboratively to provide the highest quality health care." It states that physicians diagnose and treat medical problems, whereas nurses diagnose and treat nursing problems (which may suggest to some that there is always a clear distinction, when of course there is some overlap). The piece says that nursing "can be defined as the use of clinical knowledge and judgment to help people to improve, maintain, or recover health, and to cope with disease, disability and death to achieve the best possible quality of life." It goes on to stress that nursing focuses on the whole person rather than just her illness or disability, that nurses develop "trusting relationships" with patients and families in order to uncover their real needs and devise creative solutions, and that they play a variety of roles, from caregivers to teachers to advocates. The placement of these excellent points in this paragraph clearly suggests that these features distinguish nursing from medicine. The piece concludes by urging "nursing team" members to educate the public about how they "save lives and maintain the health of millions of Americans every day." For more information, it recommends Suzanne Gordon's Nursing Against the Odds, and the Center's web site. And it urges readers to "thank the RNs, LPNs and NAs for their skill and expertise that make nursing professionals indispensable to the health care system." This is a persuasive effort not only to confront misconceptions that hold nursing back, but also to urge nurses themselves to follow Johnson's lead and speak up about it. Johnson's choice of myths reflects a desire to disentangle nursing from the sphere of physicians--debunking the handmaiden stereotype, rather than, say, the naughty nurse--and this makes sense to us. The naughty nurse seems to get nurses going more than any other stereotype (with good reason), and it remains a distressing problem throughout global culture. But we think the handmaiden is even more damaging because it's so common and so seemingly "realistic," and thus so likely to deter serious career seekers from entering nursing--not to mention discouraging decision makers from giving the profession adequate resources. However degrading the naughty nurse is, most people probably realize that nurses don't work in lingerie. But that is not true of the idea that nurses are inconsequential physician subordinates, as any viewer of the "serious" television dramas listed above can attest. We might have made clearer just how much of a tangible, real-world difference nurses make in patient outcomes, citing the ever-increasing wealth of supporting research. In other words, one of our top four myths might have been: "Nurses don't save lives or make much of a difference in patient outcomes." 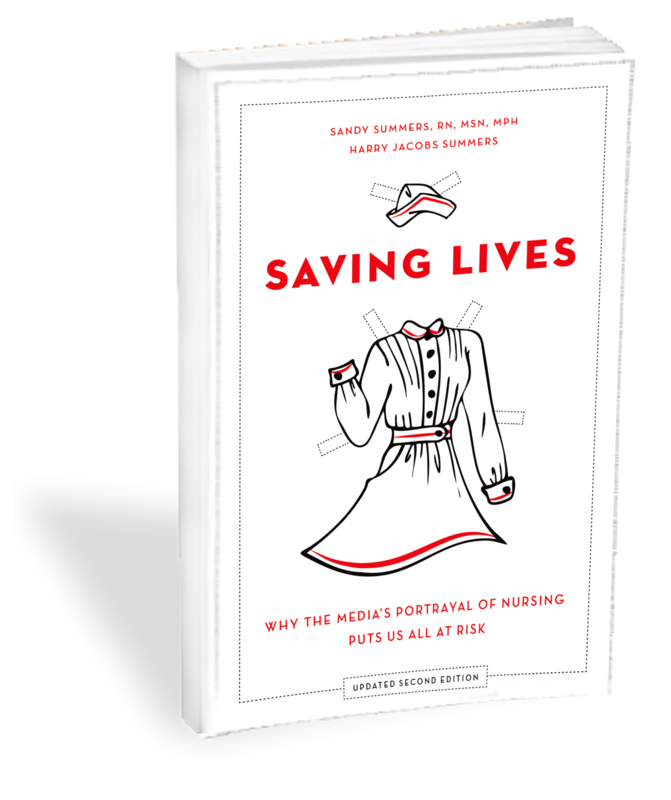 Johnson rightly notes that nurses save lives and maintain health, but some of the descriptions of nursing, with its assessments and interventions, may strike some readers as a bit theoretical without concrete examples. For instance, perhaps the piece would have been even stronger with a brief description of how a nurse might save a life by detecting a subtle change in an ICU patient's condition, by catching a small but deadly medication error, or by helping a patient stop smoking. Of course, it's not easy to clear up decades of fundamental misconceptions in one short essay, a limitation the Center knows only too well. We thank Ms. Johnson and the Ithaca Journal for this unusually helpful op-ed. See the op-ed here.